Similar to the older style Pizza Huts once popular in the 90s, the new Marsden Park Pizza Hut will offer unlimited pizza, but only on certain days of the week. The popular Dessert Hut is back with customers able to fill up on ice cream or frozen custard with toppings for $5 a cup. 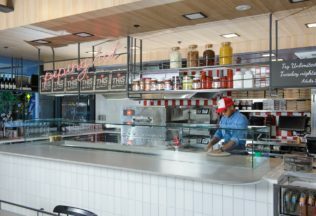 Pizza Hut Australia’s Innovation Director, Matthew Sawyer, said Pizza Hut’s new concept stores have links back to Pizza Hut’s old dine-in stores, but are updated for the next generation. “We didn’t want to forget our heritage in this rebrand,” Sawyer said. “For so many Australian adults there are fond memories of the Pizza Hut restaurants where, as a child, the experience was magical and remembered fondly.